Home / Unlabelled / EMPOWERMENT: Man Gives Bicycles, Palm Wine Tapping Items To Villagers . 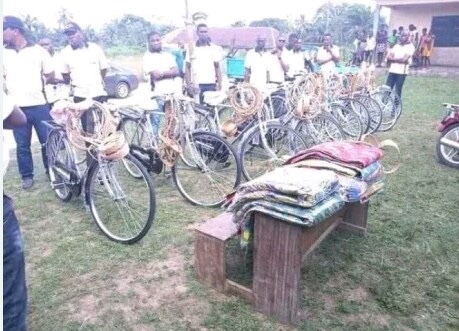 EMPOWERMENT: Man Gives Bicycles, Palm Wine Tapping Items To Villagers . Last year, the Governor of Benue State, Samuel Ortom, was largely mocked and criticised after handing over branded wheelbarrows to the youths. According to a media aide of the Governor, the gesture is to make the youths self-reliant and self-employed instead of going around looking for non-existent white collar jobs. To justify the wheelbarrow empowerment scheme, a government official noted that the move by the Governor came because Benue is a state known for farming and the governor decided to provide youths with wheelbarrows to help in carrying their produce from their farmlands.